Baroness Susan Greenfield CBE - a leading neuroscientist, writer and broadcaster - has been given an honorary degree by Middlesex University for her groundbreaking research into Alzheimer’s Disease. Baroness Greenfield heads up a multi-disciplinary research group exploring brain mechanisms linked to neurodegeneration. She is also the founding director of a company developing a novel approach to both Alzheimer's and Parkinson's diseases, and has recently written a book exploring how young people's brains are affected by modern digital technologies. 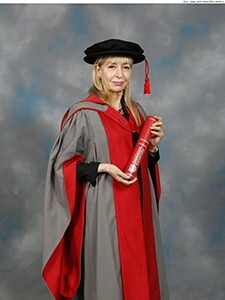 Baroness Greenfield was awarded a CBE in 2000. She is also a member of the House of Lords, having been granted a non-political life peerage - and is a big supporter of the role of science in education. She is currently a senior research fellow at Lincoln College, Oxford University. Before receiving her honorary degree from Middlesex, Baroness Greenfield said: "The fact that people recognise your work and what you have done is hugely important - it keeps you going." She went on: "Universities are so important - they are all about wealth creation and gathering new ideas. "Students graduating in science and technology are in a good position. What they are doing can lead to jobs not just directly in the sciences, but there are lots of applications in teaching, politics and industry." Middlesex University Vice-Chancellor Professor Michael Driscoll said: "Baroness Greenfield is in the vanguard of the fight against one of the most serious and distressing diseases of the 21st century. "Her achievements are a real inspiration for all students - not just those taking scientific degrees - and we are delighted to be able to present her with this award."